I first met Thomas Keller's exquisite little donuts at the end of an endlessly wonderful dinner at The French Laundry several years ago. They were the most ethereal and perfectly balanced in flavor doughnuts I had ever encountered. 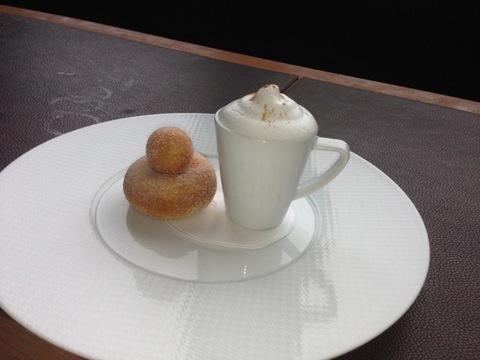 So when they appeared on the menu at Per Se, accompanied by a coffee semi-freddo, I suggested to my dear friend David Shamah that we share it, having eaten our full of lunch, and making a small stab at discipline. All I can say is that we both regretted not having ordered two of them! The semi-freddo was the essence of coffee and a far more interesting accompaniment to the doughnut than cappuccino or espresso could possibly have been.